As you know, the State of Alaska has financed its budget by spending savings for five years in a row, and the savings are running out. The deficit this fiscal year will be more than two-thirds the size of the budget. This session is the turning point. If the Legislature again balances the budget by relying on savings, there will be no ability to balance the budget in 2018 without spending a substantial amount of the Permanent Fund Earnings Reserve Account. Under current law this would drastically slash Permanent Fund Dividends. As former Alaska House Speaker Mike Bradner has pointed out, if the Legislature fails to take big steps in 2017, we will be out of money and out of time in 2018. Ignoring the revenue side of the equation in 2017 is a recipe for drastic cuts to services, a heavy reduction in Permanent Fund Dividends, and a significant loss of jobs in both the public and private sectors. The “wait and see” approach constitutes a direct threat to our economy and our way of life. Adjusted for inflation and population, the budget this fiscal year is the lowest it has been in 10 years. All State of Alaska employees could be laid off, and the State of Alaska would still have a deficit. Already the signs of a recession are all around us. Global and state realities demand that in 2017 the Legislature adopt a broad-based fiscal plan. To make the scale of the plan match the scale of the problem, both revenue and cost-reduction measures must be included. Timing is critical. The opportunity for an effective solution will be gone next year. Now is the time for bold leadership, galvanized by the needs of the next generation of Alaskans. We look forward to courageous action on behalf of all Alaskans. Do you see any of these facts as incorrect? Which of these facts do you see as most important? Which additional facts—if any—do you consider important in addressing the State of Alaska’s fiscal challenge? What specific steps do you support to address the State of Alaska’s fiscal challenge? The budget is $4.4 billion in the current fiscal year (Fiscal Year 2017— “FY17”—which runs July 1, 2016-June 30, 2017) under the traditional definition of Unrestricted General Fund, and the revenues under that definition are projected to be $1.5 billion in FY17. The resulting deficit of $2.9 billion works out to about $3,900 for every man, woman, and child in Alaska for FY17. With a proposed Governor’s budget of $4.4 billion and projected revenues by the Alaska Department of Revenue of $1.6 billion, the deficit with no other action in FY18 (July 1, 2017-June 30, 2018) would be $2.8 billion. For five years in a row (FY13-FY17), the State of Alaska is financing its deficit by spending savings, primarily the Constitutional Budget Reserve Fund. Assuming the current level of spending and the current revenue laws as well as the Alaska Department of Revenue’s most recent revenue projections, those savings spendable by the Legislature outside the Permanent Fund Earnings Reserve Account will be exhausted no later than June 30, 2019 (and very likely by December 31, 2018). That definition of “those savings spendable by the Legislature outside the Permanent Fund Earnings Reserve Account” used in the previous paragraph includes all the money in “undesignated reserves” such as the Constitutional Budget Reserve Fund, the Statutory Budget Reserve Fund, and the Alaska Housing Capital Corporation Fund plus all the money in “designated reserves” such as the Alaska Capital Income Fund, the Alaska Higher Education Investment Fund, the Revenue Sharing Fund, and the Power Cost Equalization Endowment. If the State of Alaska spent the entire Permanent Fund Earnings Reserve Account in addition to spending all the other savings spendable by the Legislature described in the previous paragraph, the Alaska Legislative Finance Division’s model shows that the State of Alaska would be out of savings outside of the Permanent Fund principal no later than the end of Fiscal Year 2025—assuming the current level of spending and the current revenue laws as well as the Alaska Department of Revenue’s most recent revenue projections. The earnings of the Permanent Fund go into the Permanent Fund Earnings Reserve Account, which has since the first payment of the Permanent Fund Dividends in 1982 has almost entirely used either to pay Permanent Fund Dividends or for inflation-proofing the Permanent Fund principal. Under current law leaving the Permanent Fund Earnings Reserve Account empty without replenishment would mean no Permanent Fund Dividends. The Governor’s proposed budget for Fiscal Year 2018 (July 1, 2017-June 30, 2018) reclassifies revenues and expenditures involving Permanent Fund earnings from “Designated General Funds” (“DGF”) to UGF. Adopting this reclassification or redefinition changes the numbers for UGF spending, UGF revenues, and the budget deficit. The budget as traditionally defined has been cut by 44 percent ($3.5 billion) between Fiscal Year 2013 and Fiscal Year 2017. The budget as traditionally defined was $4.2 billion in Fiscal Year 2007 and is $4.4 billion in Fiscal Year 2017. Adjusted for inflation and population, the budget as traditionally defined in Fiscal Year 2017 is the lowest it has been in 10 years. More than 55 percent of the Fiscal Year 2017 budget goes for K-12 education and the Department of Health and Social Services. The Alaska Department of Revenue has reported that the price of oil (Alaska North Slope West Coast or “ANS West Coast”) has ranged between $38 and $56 per barrel since July 1, 2016 (the beginning of Fiscal Year 2017). The price of oil (ANS West Coast) would have to average between $100 and $110 per barrel during Fiscal Year 2017 to balance the Fiscal Year 2017 budget without using savings. The Alaska Department of Revenue’s most recent forecast (Fall 2016 Sources Book) projects that oil prices for Alaska will be below $89 per barrel in nominal dollars for each fiscal year through Fiscal Year 2026. The State of Alaska’s oil revenues fell more than 90 percent from Fiscal Year 2012 to Fiscal Year 2016, according to the University of Alaska Anchorage’s Institute of Social and Economic Research (ISER). Oil revenues provided an average of 90 percent of Unrestricted General Fund revenues for the period of Fiscal Year 2005 through Fiscal Year 2014, according to ISER. Oil production in Alaska is projected to average less than 510,000 barrels per day in Fiscal Year 2017, according to the Alaska Department of Revenue’s most recent forecast (Fall 2016 Sources Book). Oil production in Alaska is expected to drop every year from Fiscal Year 2017 through Fiscal Year 2025, according to the Alaska Department of Revenue’s most recent forecast (Fall 2016 Sources Book). The Alaska Department of Revenue projects that by the end of Fiscal Year 2018 (June 30, 2018), there will be approximately $1 billion in oil and gas production tax credits eligible for repurchase outstanding. The amount legally required to be paid each year (the statutory minimum appropriation to the Oil and Gas Tax Credit Fund) under a statutory formula set out in AS 43.55.028(c) was $30 million in Fiscal Year 2017, and that is the amount that was paid for that type of oil and gas tax credit. The Alaska Department of Revenue’s Fall 2016 Sources Book shows that the statutory minimum appropriation to the Oil and Gas Tax Credit Fund is $74 million for Fiscal Year 2018, and also shows that the amounts for that statutory minimum appropriation for Fiscal Years 2019 to 2026 range from $54 million to $102 million per year. Oil production in Alaska averaged more than 2 million barrels per day in Fiscal Year 1988 (the peak year for Alaska oil production), according to the Alaska Department of Revenue. Pursuant to a formula set out in state statute, the Legislature appropriated $1.362 billion from the Permanent Fund Earnings Reserve Account to pay Permanent Fund Dividends in the fall of 2016. The Governor vetoed $666.35 million from that amount, leaving $695.65 million to be paid in Permanent Fund Dividends (pending a legal challenge to the veto). The money in the portion of the appropriation for Permanent Fund Dividends that was vetoed by the Governor stayed in the Permanent Fund Earnings Reserve Account. The Permanent Fund Dividend is a form of universal direct distribution of cash to residents, and Alaska is the only state that has it. Alaska is the only state with no form of state income tax paid by individuals and no statewide general sales tax, according to ISER. Alaska had a graduated (progressive) income tax paid by individuals between 1949 and 1980. Imposing an income tax of 15 percent of federal tax liability would raise $571 million per year, according to the Alaska Department of Revenue in 2015. Imposing a three percent sales tax without exemptions would raise $418 million per year, according to the Alaska Department of Revenue in 2015. Alaskans pay the lowest broad-based state taxes in the country, according to ISER. Alaska has the lowest gasoline tax of any state, according to the Tax Foundation. To eliminate the deficit with marijuana tax revenues alone, every person over 21 years of age in Alaska would have to buy more than nine pounds of legally taxed marijuana each year, according to the Alaska Department of Revenue. by ACG Chair Cliff Groh written for the Alaska Bar Rag on page 7 of the April-June 2016 edition. Let’s look past the legislative impasse as of this writing (May 10) to review some enduring truths about Alaska’s circumstances. At the end of this piece, there’s an invitation to a free event to help you learn even more. The long-term decline in Alaska oil production and the deep slump in world oil prices over the past two years have combined to create major and continuing challenges for both Alaska’s government and Alaska’s economy. The State of Alaska’s oil revenues have fallen more than 90 percent in the last four years (Fiscal Year 2012 to Fiscal Year 2016, which ends June 30, 2016). That large reduction in oil revenues is a big problem given that oil revenues provided an average of 90 percent of Unrestricted General Fund revenues for the period of Fiscal Year 2005 through Fiscal Year 2014. This sharp drop in revenues has contributed to big structural deficits both this year and in the future. The deficit is approximately $4 billion this year (FY2016), and that number is equal to about ¾ of the budget (as conventionally defined as Unrestricted General Fund spending). The State of Alaska’s ability to finance deficits using the Constitutional Budget Reserve Fund—the savings account traditionally used to fill the gap—is going away fast. The Constitutional Budget Reserve Fund (CBR) will fall to zero in less than two years at the current burn rate. Although still probably the highest per capita among the states, Alaska’s state budget has fallen and continues to fall. Adjusted for inflation and population, the operating budget is the lowest it has been in 10 years. The State of Alaska’s top three General Fund expenditures are for K-12 education, health and social services, and refundable oil tax credits. Refundable oil tax credits—which represent only a subset of all oil tax credits offered by the State of Alaska—cost $500 million this fiscal year (FY2016). As of this writing, refundable oil tax credits are projected under current law to cost $775 million in Fiscal Year 2017 (July 1, 2016-June 30, 2017), which works out to more than $1,000 per Alaskan. Alaska’s challenge is psychological and cultural as well as fiscal and political. Alaska needs to move from imagining easy prosperity to find fiscal sustainability in an era likely to feature increasing scarcity. Alaska’s legislators face a particular challenge. The Big Oil era in Alaska has made it relatively easy for lawmakers in Alaska to accommodate a lot of requests and desires for spending. Now the sharp decline in oil revenues is forcing legislators to transition to a new reality of picking winners and losers (or at least relative winners and losers). The transition is not going well so far. One or more of the following impulses seem to be driving a number of legislators: hope; expedience; desire to inflict pain; and blame-shifting. The hope is for higher oil prices. Oil prices have increased in the last few months, but—as always—it is critical to focus on scale. World oil prices would have to more than double and—given the forecasted continued declines in oil production—keep going up in real terms to solve Alaska’s fiscal problem through price increases alone. The expedience comes in with the wish of a number of lawmakers to put off big decisions until after the general election in November. Although there is a benefit to delay if that passage of time allows Alaskans to better understand the actual facts and options, the major cost is that the longer Alaskans wait to address the fiscal challenge, the lousier their options become. The desire to inflict pain comes from the expressed belief of some legislators that big and difficult decisions need to come after their constituents feel the hurt of more cutbacks. The blame-shifting part arises because a number of legislators feel a need to blame any unpopular decisions on somebody else or on some external event. One risk for Alaskans is that this external event might be a recession exacerbated by the Legislature’s actions and omissions this year. You can join other Alaskans—including probably some legislators—in learning more about the continuing fiscal and economic challenges at an event Saturday, October 1, at the Wendy Williamson Auditorium on the University of Alaska Anchorage campus. This event is free, open to all, and sponsored by Alaska Common Ground. Attending it will allow you to get more information about the facts and options as Alaska confronts the reality of paying for public services and maintaining a good economy in a new environment. Cliff Groh is a lifelong Alaskan, a lawyer, and a writer. He is also Chair of Alaska Common Ground, a non-partisan and non-profit public policy organization focused on helping Alaskans seek consensus on the major issues facing the state. He worked on oil tax legislation while serving as Special Assistant to the Alaska Commissioner of Revenue in 1987-1990 and was the principal legislative assistant on the legislation creating the Permanent Fund Dividend in 1982. OPINION: Our economic situation echoes the dark days of the late 80s, but we have the means to pre-empt a crash. “This city was dying!” That’s what Rick Mystrom said about the time between 1986 and 1989 when the Anchorage Organizing Committee made a valiant effort to be chosen to host the Olympic Winter Games. I lived in that dying city, and watched loss pile upon loss, during the spread of the self-reinforcing economic decline caused by the combination of oil industry reductions and cuts in state spending. Former Mayor Mystrom’s comment accurately reflects the prevailing mood of the community during the late 1980s. It was easy to believe that the only thing that could save Anchorage was a huge infusion of funding from Outside sources. In the end, economic rescue came from a disastrous accident, rather than joyous Olympic Games. On March 24, 1989, the Exxon Valdez oil spill caused environmental damage that resulted in a four-year infusion of new money into Alaska — $2.1 billion according to Exxon. As the headquarters of cleanup operations, Anchorage was yanked out of the economic doldrums. The biggest difference between 1986 and today is that we have revenue options that, if quickly implemented, will prevent the same kind of downward economic cycle that builds on itself and gains momentum. Alaska has the natural and human resources, the location on a global crossroad, and, yes, even the climate, that can give our state a very bright future. Though still petroleum-dependent, our economy is more diversified. The Permanent Fund has grown from $6 billion in the 1980s to $52.3 billion today. But this is still a precarious time for Anchorage and Alaska, a fact affirmed by the recent downgrading of the outlook for Alaska bonds from “stable” to “negative.” Most of us know about ripple effects that occur when a major source of new money spent in the community is cut off. When the prospective military (JBER) cuts were announced earlier this summer, government leaders immediately expressed concern about the effect on the service and supply sectors of the economy. Cuts in state spending work in the same way. Unlike individual or family budgets, changes in a public budget are not contained; instead, they spread a series of ripple effects throughout the community. If the impact of major cutbacks in state spending and oil industry spending is large enough, the ripple effect can create an economic whirlpool that will affect the whole state, especially headquarters communities such as Anchorage. That is what happened to Anchorage when the economy tanked between 1986 and 1989. Before the crash, when state income was buoyed by oil lease sales and increases in oil revenue, the Legislature spent lavishly, granting benefits to Alaska residents unheard of in other states. In 1980 the personal income tax was repealed, and the Permanent Fund dividend program was established. 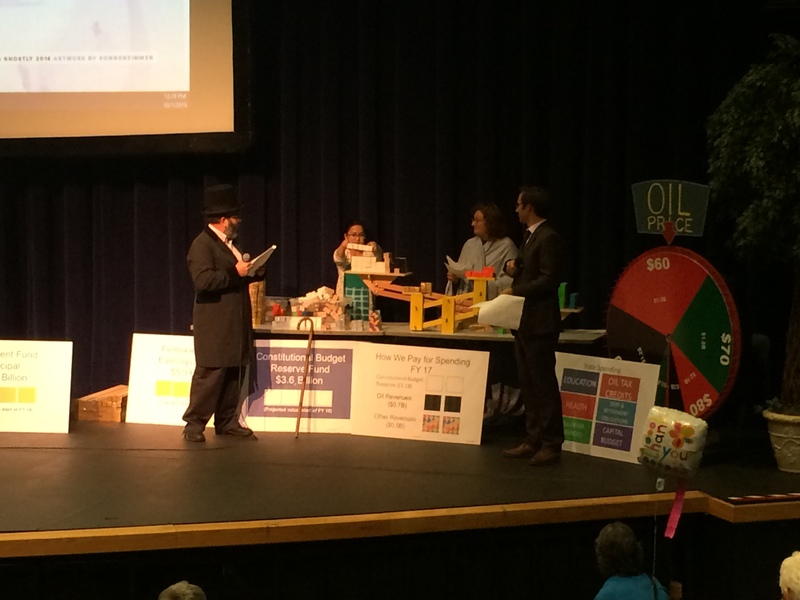 Legislators competed to include projects in the capital budget for their communities. Project 80s gave Anchorage the Sullivan Arena, the Egan Center, the Coastal Trail, the Loussac Library, the Alaska Center for the Performing Arts and more. The construction industry soared. Then, in 1986, crude oil prices fell from an inflation-adjusted all-time high of $107 per barrel to $31 per barrel, a 71 percent decline. As a young state with few other options, the Legislature cut the state spending to balance the budget. The effect on the economy was not immediate. Uncompleted “Project 80s” construction projects had a brief sustaining effect, but soon the Anchorage economy started to wither. The sudden loss of jobs, from state spending cuts and oil industry cuts, forced many Anchorage residents to leave town or reduce their own spending. This loss of new money circulating in the economy impacted the service sector, and owners of restaurants, gas stations, saloons and beauty salons, automobile companies, retail stores, architectural firms, and construction and maintenance companies, to name a few, found they had less business. They, in turn, were forced to cut staff or close and more people lost their livelihoods, found ways to spend less, or left Alaska. As the ripple effects spread and people left town or downsized, housing supply exceeded demand. Streets had rows of “for sale” signs, and property values collapsed. Many people found that their mortgage obligations exceeded the value of their property. Frequently they were unable to sell. If a work-out was possible, the forgiven debt became taxable income in the eyes of the IRS. Under these circumstances, some homeowners simply drove away. One bank employee told me he hated to open the drop box on Monday because it would be full of house keys. Burdened by bad debt, banks were hard hit. The Federal Deposit Insurance Corporation stepped in and merged failing banks into Alliance Bank, but within a short time that bank failed also. In the end, FDIC was left holding $359 million in bad or shaky loans. Eight banks, or 40 percent of all banks in Alaska, failed during the late 1980s. The downward ripples continued. Losses in local property values meant losses in municipal tax revenue. Street cleaning, snow removal, park maintenance and educational services were reduced and yet more jobs were lost. Thousands of people left Anchorage, and more from Fairbanks, Kenai-Soldotna and the Matanuska-Susitna Borough. In 1989 the Exxon Valdez oil spill “rescued” the economy of Anchorage, but it was not until 2004 that oil prices started to climb. This year, the circumstances are hauntingly similar to 1986. We have seen a drop in oil revenue of over 50 percent in one year, with little likelihood that the price of oil will increase. What’s worse, oil production has fallen steadily since the late 1980s, leaving Alaska producing less than a quarter of what the state produced a quarter-century ago. Today however, unlike 1986, we have revenue options that can take us off the merry-go-round of dependence on oil prices. Timing is of the essence. The Legislature needs to act now — immediately — to put Alaska’s economy on a stable footing. The Rasmuson Foundation’s recent poll of Alaska’s registered voters provides statistically sound information that voters favor revenue sources over additional cuts. The poll offers a basis for bipartisan legislative action to adopt revenue options while they are still available. To understand the choices and their importance to all Alaskans, you are encouraged to attend a free forum on Alaska’s Fiscal and Economic Future sponsored by Alaska Common Ground and the UAA Institute of Social and Economic Research from 9 a.m. to 4 p.m. on Saturday, Sept. 19, in the Wendy Williamson Auditorium at UAA. Janet McCabe and her family have lived in Anchorage since 1964. A community planner specializing in employment and population projections, she was actively involved in numerous forums dealing with the 1980s fiscal crisis. She is a member of Alaska Common Ground. The dominant role of oil in the state budget—taxes and royalties from oil production account for more than 85 percent of the State of Alaska’s Unrestricted General Fund revenues (the Unrestricted General Fund is what most people mean when they say “the state budget”). Partly because of (2) and (3) above, the unlikelihood of oil prices rebounding enough to bail Alaska out of this dilemma. With revenues sharply down, matters are complicated by the desires many Alaskans have for more state spending in various areas. Add it up, and you have an ugly picture. The budget this year (Fiscal Year 2015—or FY2015—which runs July 1, 2014-June 30, 2015) balances at oil prices of about $117 per barrel. Oil prices are below $50 per barrel as of this writing, and the Alaska Department of Revenue has reduced its oil price forecast to $65 for the rest of FY2015 and $66 for FY2016. With an approximately $6 billion state budget and revenues looking likely to be approximately $2.5 billion this year, the budget deficit at current oil prices and production would be close to $3.5 billion in FY2015. This means that the State of Alaska would have a budget deficit of more than 50 percent in the current fiscal year. What follows is an attempt at a comprehensive catalogue of the steps the State of Alaska could take to address the fiscal challenge. This is an exercise in description, not prescription. No endorsement of any course of action is intended, and there is no discussion here of the many pros and cons of these approaches, whether philosophical, practical, or otherwise. Some of these items are obviously far less politically or practically possible than others. Note also that although the list below includes dollar estimates for amounts possibly gained or saved regarding some of the items listed, not all of the fiscal impacts are easily predictable. The long-term decline in Alaska oil production—now compounded by the recent sharp drop in oil prices—poses tough questions for Alaska. 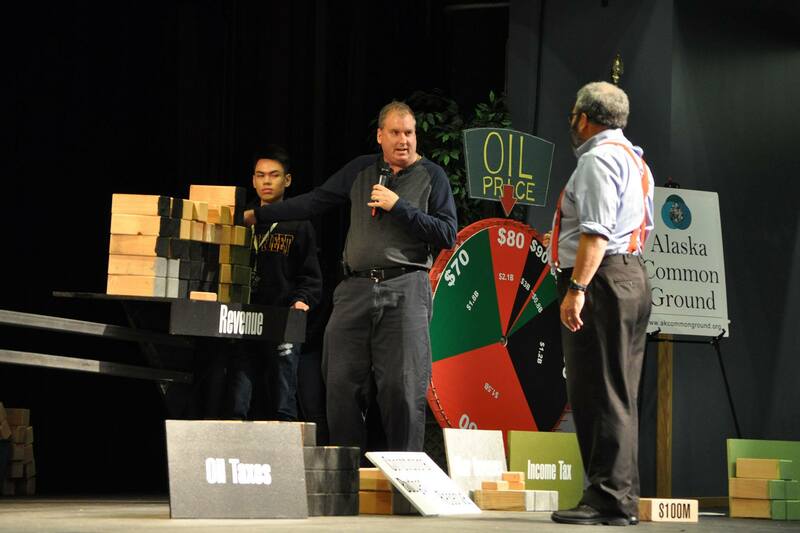 Those questions are made tougher by the effects that the journey down the Prudhoe Bay Curve will have on the economy as well as the government, given that the oil industry accounts—directly or indirectly—for approximately one-half of all the jobs in the state. Alaskans need to think deeply and carefully about the implications of the various steps we could take to address these questions. Cliff Groh is a lifelong Alaskan and a lawyer and writer. Groh authored a chapter for the 2012 book Exporting the Alaska Model: Adapting the Permanent Fund Dividend for Reform around the World (Palgrave Macmillan, 2012), and some of the material in this essay overlaps with that chapter. That chapter was one of four chapters Groh authored or co-authored for that book or for the 2012 book Alaska’s Permanent Fund Dividend: Examining its Suitability as a Model (Palgrave Macmillan 2012). Groh was involved in the creation of the per capita Permanent Fund Dividend Alaska has today while serving as an assistant to the Alaska Legislature in 1982. Groh was also Special Assistant to the Alaska Commissioner of Revenue in 1987-1990 and a delegate to the Conference of Alaskans in 2004. A board member of Alaska Common Ground for almost two decades, Groh became that organization’s chair in May of 2014. 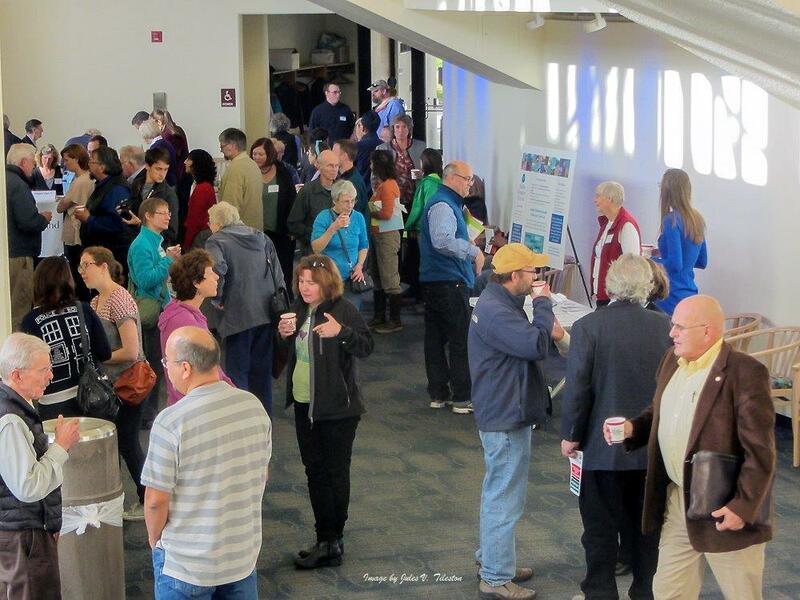 We invite you to Alaska Common Ground’s annual membership meeting followed by a forum on Healthcare Costs in Alaska on Saturday, May 9 at the BP Energy Center, 900 E. Benson Blvd. in midtown Anchorage. Doors will open at 8:30 am for coffee and snacks, with the annual business meeting beginning at 9 am. We’ll bring you up to date on our successful forums and events this past year as well as what we’re planning for the upcoming year. As always we will elect board members and have time for member input and discussion. Our forum on Healthcare Costs in Alaska will run from 10 am to noon. We will explore the high cost of healthcare in Alaska, discuss possible solutions, and drill down on how healthcare costs affect Alaska’s fiscal future. Forum panelists include Dr. Mouhcine Guetabbi, ISER; Deb Erickson, Executive Director of the Alaska Health Care Commission; Greg Loudon, member of the Health Care Commission, Insurance Broker and Health Benefits Consultant; and Doug Eby of Southcentral Foundation. Mark Foster of the Anchorage School District will moderate the panel. Forum co-sponsors include ISER, Anchorage Public Library, AARP, and the League of Women Voters of Anchorage. 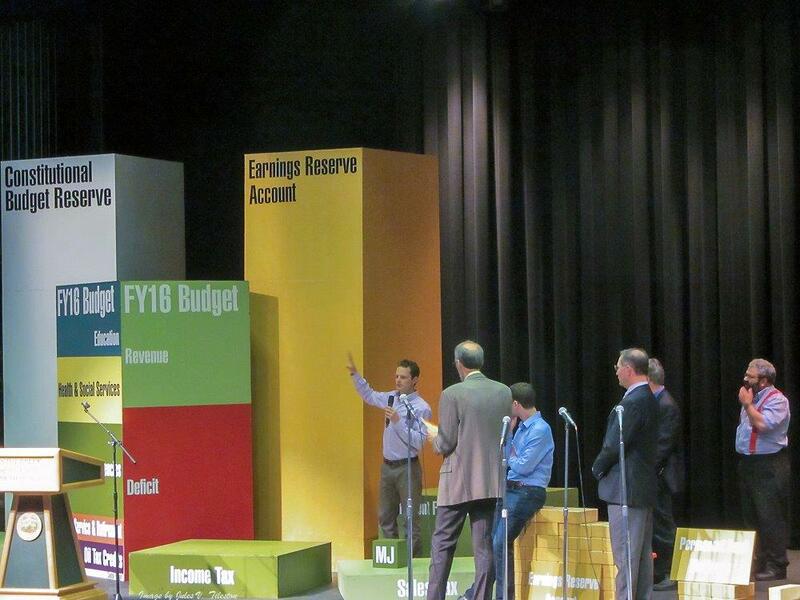 On September 19, we will hold a second forum on Alaska’s fiscal future, building on our previous forum on this topic. In November, either the 7th or 14th, we will hold a forum on climate change, focusing on climate change impacts in Alaska and what a climate change policy for our state might look like. Mark your calendars for all of these forums! 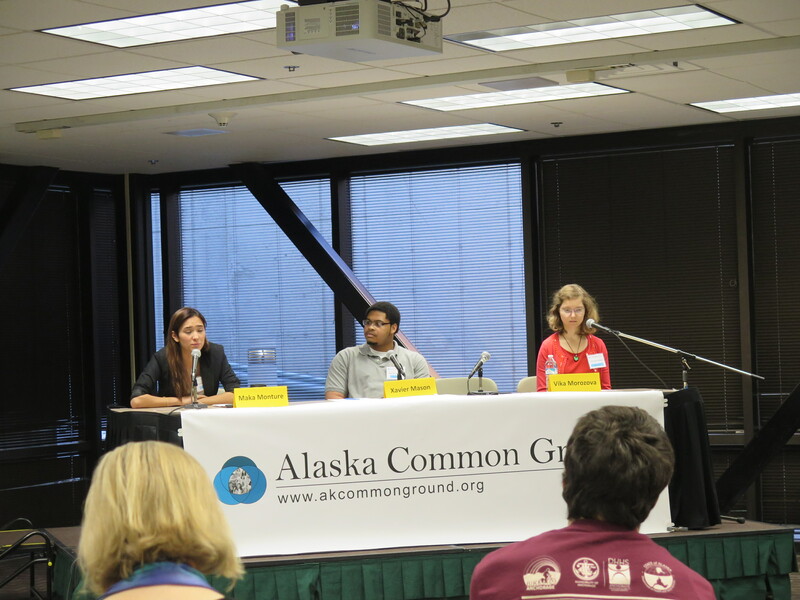 This past year was busy for Alaska Common Ground. Click here for a list of the forums we held and co-sponsored and related public and media events during the past year. We think you will join us in celebrating a successful year! We encourage you to re-new your membership and consider upgrading your membership to a higher level, or contributing financial support for a particular forum to support this work. We have been busy these past few months and hope that you were able to attend one of our forums are came to our annual meeting last May. 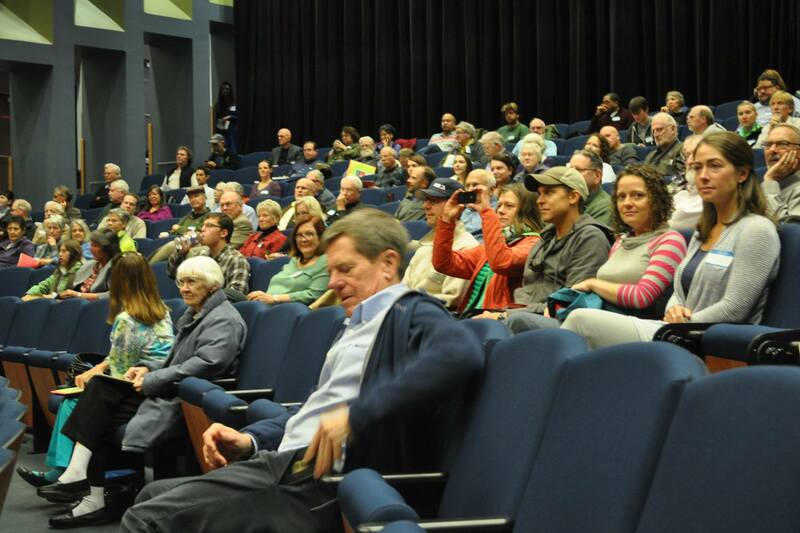 As you know, our organization put on five well-attended and well-received forums on Alaska’s important issues. Four of these five non-partisan forums covered the ballot propositions Alaskans voted on this year. 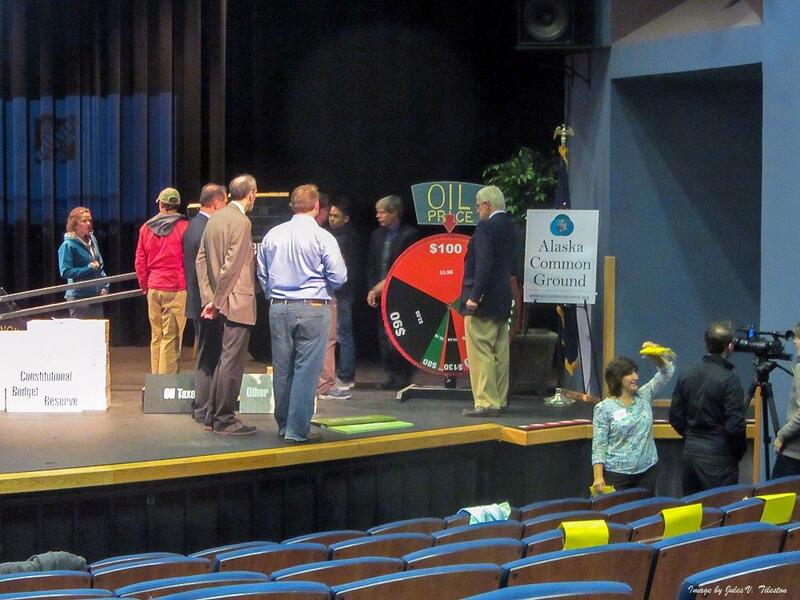 The fifth was an all-day event addressing Alaska’s biggest and most complicated problem—the fiscal challenge caused by falling oil production and the threat of oil prices lower than expected. Links to the audio and video of each of these five forums are available on this website under Forums. Along with doing all this in 2014, we also sponsored the Let’s Talk Alaska dialogues on Wednesday evenings and held our annual meeting in May. Alaska Common Ground was fortunate to have a lot of help in putting on these events. All our forums were co-sponsored by the Anchorage Public Library, the League of Women Voters of Anchorage, the League of Women Voters of Alaska, and Alaska Integrated Media. 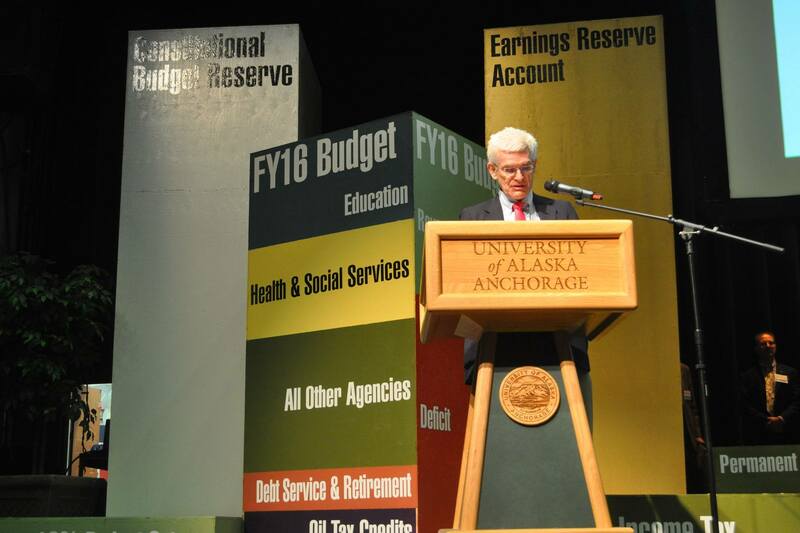 The University of Alaska’s Institute of Social and Economic Research (ISER) partnered with us on the Forum on Alaska’s Fiscal Future, which was also co-sponsored by Northrim Bank, First National Bank Alaska, Commonwealth North, and C.M. Bidwell and Associates. The co-sponsorship of Alaska Integrated Media (AIM)—a company owning five radio stations—led to the airing of more than 2,000 commercials promoting the forums, significantly increasing our visibility to audiences not typically reached by Alaska Common Ground. 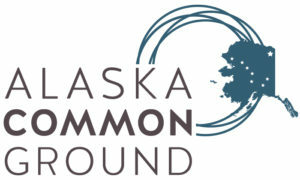 Alaska Common Ground is a small non-profit organization run by and for Alaskans. Most of our work is accomplished by our volunteers—both our board of directors and our members—but some of what we do necessarily costs money. Alaska Common Ground needs money, for example, to pay for advertising for our events and for wages for our part-time staff member. Some of that money comes as grants from institutional sponsors, but most of it comes from individual members like you. In addition, we still offer our $10 membership for a person on a limited budget or a student. I thank our existing members, and I welcome our new members for their support of Alaska Common Ground and this important work. I urge you to send us a check or go on-line to renew your membership—today. Please consider upgrading your membership category to help Alaska Common Ground to continue to put on high-quality, unbiased events of importance to Alaskans. 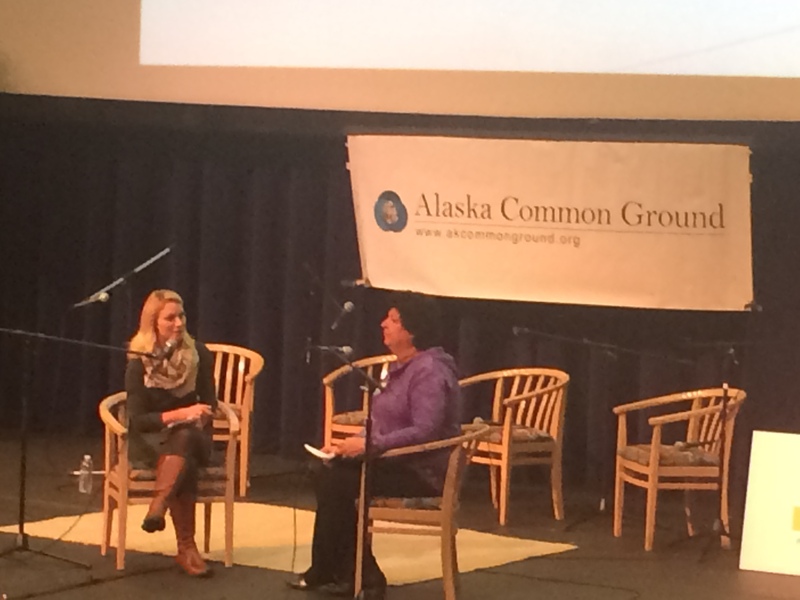 Thanks again, and I look forward to seeing you at an Alaska Common Ground event soon.